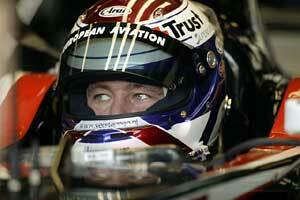 Like Jarno Trulli, dutchman Jos Verstappen made the jump into F1 when he had fewer than 50 car races under his belt. The karting sensation jumped into the German F3 series in 1993, and after dominating the season suddenly found himself offered an Arrows test at Estoril. Making the most of the opportunity he set some very quick times and looked set for a role as McLaren's test driver for 1994. But right at the last moment Benetton boss Flavio Briatore stepped in and snatched him from beneath Ron Dennis' nose. Then, to ice the fairy cake, Verstappen suddenly found himself thrust from the role of Benetton tester to Benetton racer when JJ Lehto injured his neck in a pre-season testing shunt at Silverstone. He thus lined up with illustrious teammate Michael Schumacher on the grid at Interlagos, an F1 racer even before he had reached his half century of races outside karts. Verstappen was involved in a four-car shunt in that race, and worse lay in store as his Benetton was famously engulfed in flames during a pit stop in Germany that went wrong. But both times he stayed remarkably calm, and dismissed both incidents. A fortnight after the fire he scored his best result to date, finishing third in Hungary. Benetton dropped him for 1995 and he drifted to Simtek before that gauche outfit pulled out at Monaco. Then he resurfaced with Arrows in 1996, racing strongly and surviving a very heavy shunt at Spa. For 1997 he had a seat at Tyrrell, where he showed well against Mika Salo but could do no better than eighth at Monaco. He made his fourth F1 comeback with Stewart midway through 1998 when the team finally dropped Jan Magnussen, but it was another unhappy alliance that failed to gel and he in turn made way for Johnny Herbert for 1999. Once again Verstappen was obliged to sit on the sidelines, running his kart racing school and looking after his own proteges until the call came for yet another comeback, this time with Arrows for 2000. Dumped by the team at the start of 2002 to make way for Heinz-Harald Frentzen, Verstappen was forced to sit out the season but returned in 2003 with Minardi.He dropped from the F1 scene in 2004.